This paper compared sustainability effects of ICEVs, EVs in the EU today and 2050. 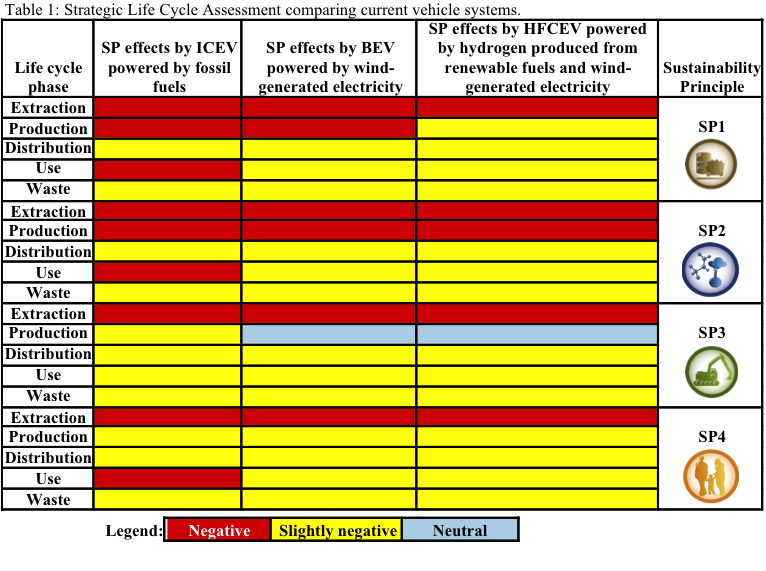 It used SLCA to identify major violations of the SPs (Table 1) where EVs powered by battery or fuel cells have less sustainability violations than ICEVs powered by fossil fuels. The authors found major violations of sustainability principles like use of fossil fuels, use of scarce materials for batteries and fuel cells, and also in most life cycle phases for all vehicles when using fossil fuel vehicles for mining, production and transport. Still, the studied current battery and hydrogen fuel cell cars have less severe violations than fossil fuel cars. An LCA, including uncertainty considerations, then quantified environmental impacts within these sustainability violations. 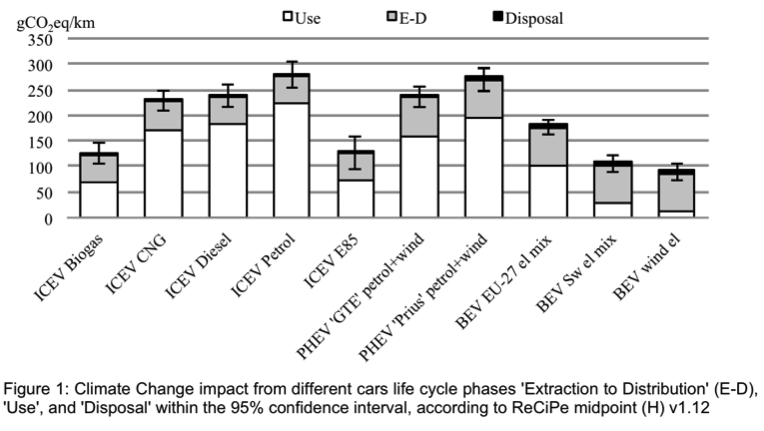 For example, the LCA found that BEV cars powered by electricity from EU-27 electricity grid have less life cycle climate change impact and overall less life cycle environmental impact than ICEV cars powered by petrol, but on the other hand have 50% higher climate change impact and overall higher life cycle environmental impact than BEV cars powered by electricity generated from wind turbines. By 2050, there will likely be even more sustainable alternatives than the studied EVs when the EU electricity mix mainly should stem from renewable sources, batteries should be recycled, fuel cells should be a mature technology for vehicles (containing no scarce materials), and electric motors should have replaced combustion engines in other sectors. An uncertainty for fuel cells in 2050 is whether the production of hydrogen will have had time to switch to renewable resources. If so, that would contribute even more to a sustainable development. Published as: Borén, S., Ny, H., 2016. A Strategic Sustainability and Life Cycle Analysis of Electric Vehicles in EU today and by 2050, Proceedings of the 18th International Conference on Sustainable Urban Transport and Environment (ICSUTE), Madrid, Spain, March 24-25, 2016.